I can't believe I begged for more levels when I reviewed the first one. Ninja Usagimaru is back. Unfortunately, he brought way harder puzzles this time. The opening levels of the block-puzzle game are on par with levels from the back-half of the original. While the block-moving mechanics remained the same, I had to move the blocks quite a few more times. This sequel keeps the same art style and gameplay, but the enemies have gotten a huge art upgrade. The black blobs from the original have been relegated to a single world, letting more colorful characters fill stages from the other five. Usagimaru keeps his kite, grappling hook and kunai from the first game and adds a rope for crossing gaps and a pinwheel that can be placed anywhere as a checkpoint. The pinwheel is the most useful addition, as it serves as a checkpoint for the longer levels and even appears as an option on the “Retry?” screen which saves a great deal of time. The story is pretty much the same as before with a village full of rabbit-people disappearing and our hero moving blocks around to save them. Each villager must be rescued by crushing a demon, then untied and led to the exit. Each world has a different theme, such as a mountain hot spring or a hidden village, and they're varied enough to stay interesting. Each world ends with a short story segment. At first, I was excited to be back. Most of the levels require a lot more thinking than before, and I felt really clever as I completed each puzzle. But eventually, the levels became frustratingly hard. Levels would stretch on, reaching dozens of minutes and countless retries. The bunny-god on the bottom screen gives mockingly-simple advice that made me feel hopeless. I thought about the puzzles when I wasn’t playing. Ninja Usagimaru threw blocks back and forth across my mind. Of the twenty hours spent on the game, almost half of them were spent on a single level toward the end of the game. No matter which way I arranged the blocks, I felt claustrophobic and like I was a block short. I spent days trying to solve this puzzle. On the fourth day, I dreamt that someone had posted the answer on Miiverse. When I checked, it was one of the only posts on the page, posted about an hour before. The solution was so convoluted that I felt angry instead of dumb. After the end of the game, a secret world opens up with completely different objectives for each puzzle. 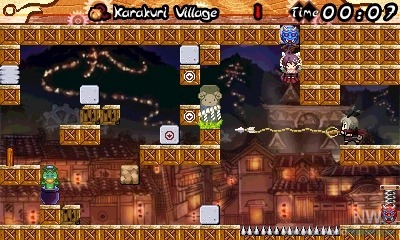 Instead of leading villagers around, Usagimaru has to squash enemies or prove his prowess with the grappling hook. These levels were a lot more fun than the tedious block puzzles of the main game and used the tools of the game in some interesting new ways. 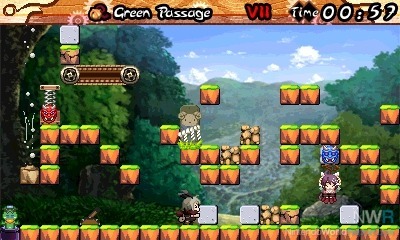 If there's another Usagimaru game, I hope they have more objectives than just saving a villager in each level. While Ninja Usagimaru: The Mysterious Karakugi Castle had some levels that were way too hard, the formula and presentation still work. Most of the levels left me feeling clever, with only a handful leaving me feeling dumb. I would recommend this game to anyone that beat the first one, but this is not the place to start. Review copy provided by Aksys Games.